Mumbai: India’s largest information technology (IT) services firm, Tata Consultancy Services Ltd (TCS), posted a stellar Q4 results that beat analyst estimates both on revenue and profitability. The double-digit growth for the quarter came on the back of thirteen straight quarters of underperformance, and the board of the Mumbai-based company immediately rewarded shareholders with a 1:1 bonus issue while also recommending a final dividend of Rs29 per share. Significantly, TCS added $1.51 billion in incremental revenue in 2017-18, about twice the $731 million in new business done by Infosys Ltd, the country’s second largest IT outsourcing firm. 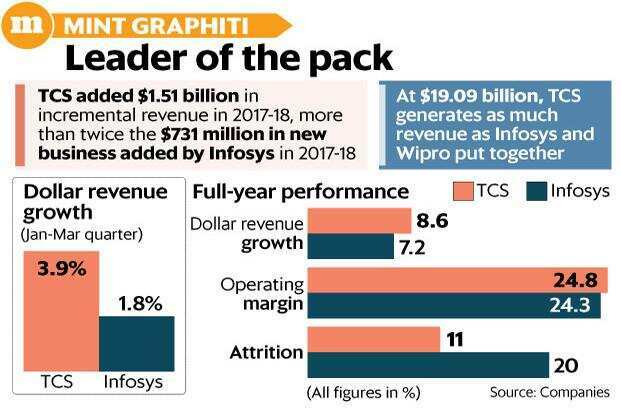 Although TCS’s profitability declined, the management, unlike that of its smaller rival Infosys, expressed confidence in retaining its aspirational profitability range of more than 25% for the current year. The company’s dollar revenue increased 3.9% (2% in constant currency terms) to $4.97 billion in the quarter ended 31 March from the preceding three months, thanks to higher client spend from most of its geographies and key industry verticals. Net profit improved 5.7% to $1.07 billion in the March quarter from $1.01 billion in the preceding three months while operating margin improved 20 basis points to 25.4% from 25.2% in the October-December period. A Bloomberg survey of 26 analysts had forecast TCS to report revenue of $4.85 billion, or Rs31,659.7 crore, in the quarter. The analysts estimated the company to report a net profit of $1.05 billion, or Rs6,810.3,7 crore, in the period. “I’m very happy with the strong set of Q4 earnings for what is a turnaround year for TCS as we are back to double-digit trajectory (11.7% year-over-year dollar revenue growth in January-March period)," said TCS CEO Rajesh Gopinathan. TCS does not give quarterly or annual forecasts but a few equity analysts expect the company to report a double-digit growth in the current year, primarily on account of winning large outsourcing contracts. “Solid Q4 with a revenue beat and a slight miss on margins," analysts Anantha Narayan and Nitin Jain of Credit Suisse wrote in a note to investors after TCS Q4 results. “The management is sounding incrementally more hopeful on financial services: in Q4 FY18, BFSI remained muted with 0.4% QoQ growth (2.9% YoY) and so did North America with 0.2% QoQ (4.9% YoY).... Management thinks BFSI has likely bottomed out and hopes to see signs of recovery in Q1 FY19." TCS ended FY18 with $19.09 billion in revenue, a 8.6% year-on-year growth, and 24.8% operating margin, better than 6.2% in 2016-17 but its profitability was 90 basis points lower than last year when it was 25.7%. In constant currency terms, TCS reported a 6.7% growth, as against the 5.8% growth that Infosys managed. Both figures were however lower than industry body Nasscom’s estimate of 7.8% growth last year. TCS shares were up 0.99% at Rs3,190.65 on the BSE at the close of trading on a day when the benchmark Sensex gained 0.28% to end at 34,427.29. The TCS results were reported after market hours.